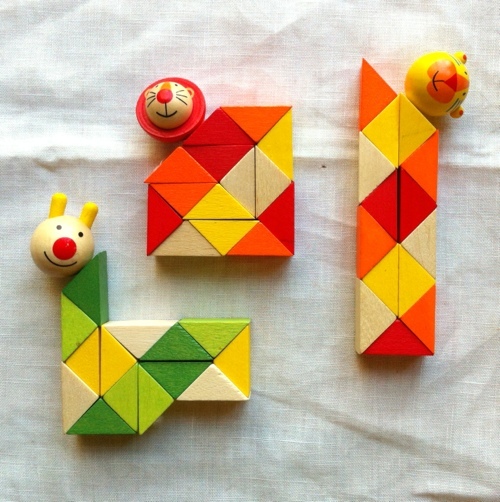 Our friends in São Paulo gave our daughter these cute wooden folding toys. They’ve got elastic running through the middle, so you can twist the pieces around and make different shapes. After playing with them for a while, I noticed that they have an interesting mathematical property: when folded into any flat shape, any two triangles that meet are always the same color, forming a grid of diamonds (or squares, depending on your point of view.) I can’t help wondering why this is. It has something to do with the repeating pattern of four colors, obviously, but what? Previous PostMadagascar fans at the Jardim BotanicoNext PostPainterly rendering in your pocket. I swear I had something like this when I was a kid. I think you can tetris them into a single large cube or at least the ones I had could do that. Be warned though, these kind of toys make kids like geometry. I wonder if you made a really smal four pixel texture map if a similar color patter would be propagated on a model? Like if you fold an arm the patterns would show. Surely, Steven Wolfram would have something to say about all this.